Perfect luxury combined with just enough space to be comfortable and yet still not too difficult to drive and park. What better way to explore the country than at your own pace and at the comfort of a place that is home away from home. We have the perfect set up for you. Our RV is a Ready to Roll set up. All the linens/flatware/dining/cooking and other misc. items are included. It also includes an awning rug, small camping table, 6 camping chairs. All you need to bring is your clothing, food and any other personal vacation items you desire, there is plenty of storage for all your needs. After each rental the RV is professionally cleaned and laundered. So, you can rest assured you are in your own environment. If you don’t have any RV experience don’t worry, we will train you how to operate the vehicle until you feel completely confident operating on your own. I have safe parking at RV location for pickup during your trip. 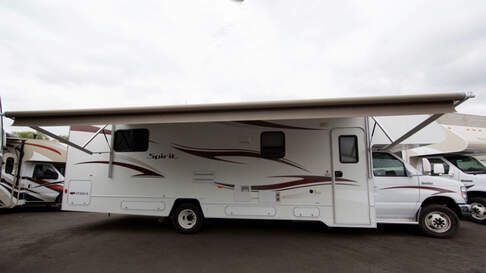 ► This very spacious mid-sized RV comfortably accommodates up to 6 adults and one child. The well-designed floorplan maximizes live and sleep space with one full-side slide out that further expands the kitchen and living room. The private master bedroom has a walk around queen bed with ample closet space for two. The large horse-shoe dinette and couch both convert into full beds, with additional sleeping in the over-cab bunk. The fully- equipped kitchen has two bay sinks, an oven, a microwave, a three-burner stove and ample counter space. Additional features include a large 20-foot power awning, optional solar panel for charging, large external storage, HDTV entertainment throughout and more. ► This high mileage, luxury, easy to drive RV offers the most spacious and open floor plan available in the Sprinter Chassis category. Huge upgrades including 4 AGM house batteries and 640 Watts of rooftop solar panels and a 3000 watt inverter set up and ready to take you off-grid! Up to six people can enjoy this very comfortable living area with its full entertainment system and fully-equipped kitchen. The corner queen bed, the large convertible dinette and the over-cab bed each sleep two. 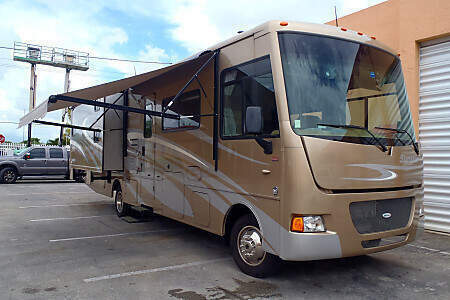 Additional features of this very popular RV include expansive interior and exterior storage, extensive solar & power systems, swivel cockpit seats, an outdoor shower and more. You will not find a rental like this anywhere. State of the Art - Brand New - 2019 Class B Adventure RV. 4 seat belts. Sleeps 2 adults and 2 kids. Fully set up for off the grid Van life. Rooftop solar, inverter, satellite radio, dash navigation system and more! Since its introduction, the Winnebago Travato 59G has become one of the best-selling Class B Adventure van in America. Built on the powerful Ram ProMaster gas chassis, the Travato offers all the comforts of home in a nimble, fuel-efficient, high MPG package. The Travato uses Winnebago's SmartSpace design approach to maximize your living and storage space, and features premium amenities like Corian countertops, the FROLI deluxe full size bed and twin size convertible dinette, and the energy-saving Truma ECO Plus heating system. Powered armless awning and an exterior wash station. Seatbelts for 4. High MPG 6 cylinder gas engine. Renters consistently rate this vehicle as excellent. A very good option for couples or families. This vehicle is from a private owner. San Diego is known across the country for its beautiful weather, friendly people, incredible nightlife, great food, and ample attractions. With so many unique people to meet, museums to explore, things to eat, and beaches to comb, it’s easy to understand why this sunny city continuously tops out as one of the most-visited places on the West Coast. If you’re planning a trip to sunny San Diego in the near future, make sure you have everything you need by renting an RV for your journey. Campanda is the leader in RV rentals in San Diego and we promise to get you on the road and off to adventure in no time at all. With more than 1,381,000 people, San Diego is the second largest city in California, so it’s obvious that there’s a lot to see! Travelers who want to visit San Diego, however, are often disappointed as hotels can be expensive, especially during peak season. It can be difficult to plan an itinerary that allows you to see all the sights. Fortunately, there’s a way around both of these problems! 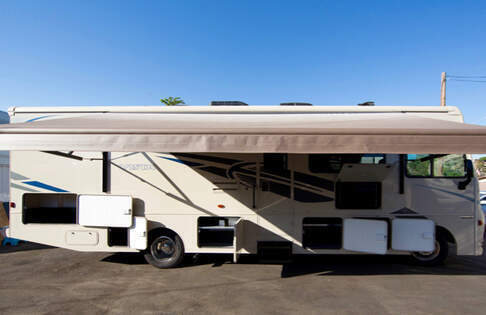 By securing an RV rental in San Diego, CA, you cut out the lofty price tag of expensive hotels and ensure that, no matter where you are, you have a comfortable place to sleep in your little home on wheels. Additionally, renting an RV in San Diego means you’ll contend with less traffic and have more time to explore all of the attractions the area has to offer! Beaches: From the famous Mission Beach to the less-known Coronado beach, San Diego is an embarrassment of riches when it comes to sun, sand, and surf. Hang ten on a killer wave or watch for whales from the shore – there’s no shortage of things to do on these beautiful beaches. Restaurants: There are dozens of great places to eat in San Diego. From upscale gastro pub fare to fresh fish tacos with a view of the water, don’t miss taking a culinary tour of the city. Popular Parks: For a day of picnicking with family or friends, head to Balboa Park, which offers plenty of green space and ample room to stretch your legs and enjoy the sun. Cultural Attractions: From the San Diego Natural History Museum to the San Diego Museum of Art, it’s easy to spend a day wandering the halls of these incredible cultural institutions. Sports: Catch a game at Balboa Stadium and enjoy a hot dog with your friends – it’s an experience you’ll never forget! Class A RVs. The Class A RV is our most luxurious model. Offering ample sleeping and storage space and plenty of high-class amenities, this RV is perfect for people who want to travel in style and bring all the comforts of home with them wherever they go. Class B & C RVs The Class B & C RVs are perfect for people who want to combine luxurious amenities with outstanding affordability. Ideal for families, friends, and much, much more, these comfortable models are some of our most-rented options. Travel Trailers If you’d prefer to camp rather than stay in RV parks, a travel trailer is a fantastic option for you. Portable, comfortable and safe, the travel trailer is a great fit for the traveler who wants to cover hundreds or even thousands of miles in comfort and style. Vans If you’re looking for something that’s a happy medium between your domestic car and our large RVs, look no further than our selection of vans. 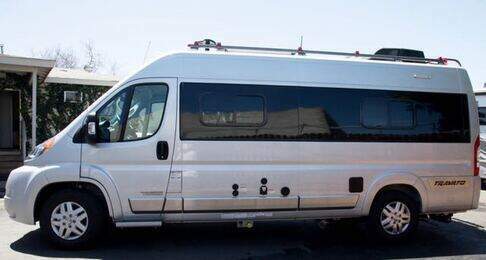 Designed with comfort and portability in mind, these vans are perfect for multi-day or multi-week trips with a small group. Why Choose Campanda for your RV Rental in San Diego, CA? If you’re itching to see sunny San Diego, there’s no time like the present and at Campanda, we understand that. 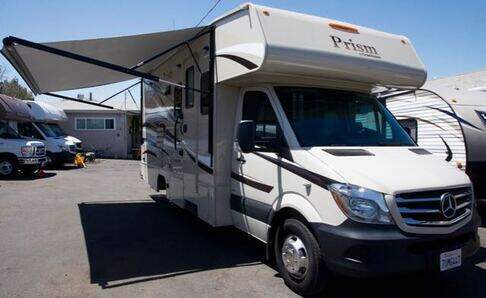 We’re the leader in San Diego RV rentals and we promise to do everything we can to ensure that your trip of a lifetime gets off on the right foot in the perfect RV rental in San Diego. From helping you select the right RV rental for you to showing you a wide selection of budget-friendly options, our support staff is dedicated to your satisfaction and happiness. Additionally, we only rent clean, safe, well-serviced vehicles at Campanda, which means that you can go through your entire trip with the peace of mind that comes from knowing you’re in a solid vehicle. Whether you’re traversing mountain passes or cruising down Route 66, our quality RVs are the perfect partner for your upcoming adventure. When you contact Campanda to rent an RV, you’ll be put in touch with compassionate, knowledgeable, helpful support personnel who will take the time needed to answer all of your questions. They’ll help you pick the right RV for you and plan all of the details of your upcoming trip, including RV pick-up and drop-off locations. Regardless of whether you’re a seasoned RV renter or you’ve never done anything like this before, we promise that working with Campanda is simple and painless every single time.